There are times when I’m ever so grateful for the fact that dh’s mom was a Home Economics teacher – he grew up learning how to cook, clean and sew. SCORE! He also came into our relationship armed with some heirloom recipes, things passed down from his grandmothers and mother, while I came in with Joy of Cooking and some Julia Child books. Clearly, we balance each other out. To save on dishes, you can cook the pasta in an oven and stove-safe dish (such as a Le Creuset or other enameled cast iron). We don’t usually have an issue with two dishes to clean instead of one – but you know me: I’m all about making it easy on ya. Note: if you don’t have time for the “bake” part of this dish’s name, don’t panic. When you get to the point that the ingredients have been combined, cook on the stove for just long enough to reduce the amount of liquid dramatically; this dish should be coated with the sauce but not saucy (eg. no pools of liquid on the plate). 1. Prepare the macaroni as directed on the box. 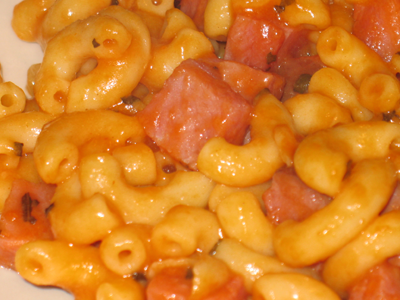 While the macaroni is cooking, dice the ham into 1/2″ cubes. 3. Once the macaroni is done cooking, drain, then add the other ingredients from the list above. Stir well to combine. 4. Place the mixture into an oven-safe container and bake for 45 mins. This entry was posted in crock pot cooking, entrees and tagged cooking, crock pot, crockpot, ham by crunchymetromom. Bookmark the permalink.